Vulnerable women in Carlisle are now being provided with resources and knowledge to enable them to have the skills and confidence to improve their lives. 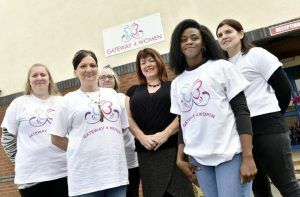 Gateway 4 Women is a new centre offering a welcoming and women-only space, bringing a range of services together under one roof, based in Denton Holme. Set up by Cumbria Gateway in 2017, the project provides advice, education and support for women who are experiencing difficult circumstances such as domestic violence, drug and alcohol rehabilitation or mental health problems. By learning new skills, gaining qualifications, building confidence and meeting new people, women benefit from improved health and wellbeing. The centre helps girls, some as young as 15, who are pregnant and have been told to leave their parents’ homes. It also supports ex-offenders who cannot leave prison unless they have an address. Support includes ensuring the person has a safe place to sleep, food vouchers, benefit advice and help with addiction. Members in later stages of recovery provide hope for new members that recovery is possible while they themselves gain a sense of purpose, increased self-esteem and continue to grow in positive relationships with others. A grant of £2,700 from the Fryer Grassroots Fund and the Violet Laidlaw Trust Fund provided IT provision to enable clients access to a range of training and online services. Open 5 days per week, volunteers have been trained to facilitate this provision and can now offer a full range of qualifications through Social Care TV, an online accredited e-learning system. The computers will also enable clients to fill in required forms and apply for jobs to enable them to start to rebuild their lives. The centre is able to self-sustain the IT provision with its own generated income via its social enterprise venture.